The construction industry has come a long way in recent years. Not only have the physical tools and machinery continued to advance, so has the technology used for both small and large-scale projects. With technology moving to the cloud, collaboration and management capabilities have advanced to new heights. If you’re planning to build and want to be hands-on during the process, it’s always a great idea to keep up with the latest construction trends. This will give you a better understanding of what’s involved in the planning and building of your new home – allowing you to better understand the thought processes and decisions made by your builder. While the list of advancements in the construction industry continues to grow, here are five of the most notable advancements in recent years. 1. Surveying methods & technology. Traditionally, the most basic construction surveying would involve workers on foot measuring distances between multiple points. However, surveying companies have made the move towards advanced LiDAR scanners to provide accurate and detailed geospatial information. This form of laser scanning can be carried out in a fraction of the time and usually provides more precise data than traditional surveying methods. Laser technology is also starting to be more widely used in a range of other industries as well, such as archaeology where it’s been monumental in finding ancient ruins such as the hidden Maya ruins in Guatemala. As it continues to be used in a range of industries, it’s expected to continually improve becoming more accurate and advanced than ever seen before. 2. Building information modelling (BIM). Planning took a big step forward when Computer-Aided Design (CAD) was introduced, allowing construction professionals to move away from traditional 2D blueprint planning. This software allowed them to make accurate 3D modelling of construction projects while assigning costs, material types and more advanced data with ease. This then advanced further to what is commonly known as building information modelling, or BIM for short. BIM allows users to access the data in a more collaborative setting and from any location with internet access. When users make changes to a project through their BIM software, it will automatically update the account so all other users see the changes in real time. This improved collaboration makes for more accurate and precise data, helping projects stay within schedule and budget. While construction is the third highest industry for Australian workplace fatalities, Personal Protective Equipment (PPE) is continually advancing to meet the demand for safer, and more user-friendly equipment. The improved hardness of materials and advanced designs makes for improved health and safety conditions for construction workers. Recently, there has also been a lot of research, prototyping and design in PPE to advance safety ratings even further. This involves the development of smart wearables and sensors to alert workers to potential safety hazards. While the technology is still undergoing crucial testing, these advancements are sure to provide improved safety throughout the construction industry. The prefabrication of materials offsite has contributed greatly to the construction industry, speeding up build time without compromising on quality. This also helps to reduce noise and disruptions on-site, which reduces complaints and issues from surrounding homeowners. With many construction companies improving the efficiency and production rate of prefabricated materials, it’s likely to continue as an advancing trend. Prefabrication usually also results in a reduced-cost benefit for people looking to build a new home on a tight budget. What started as small machines which had the ability to print 3D objects using plastic materials, 3D printing is now being used on large scale construction works. 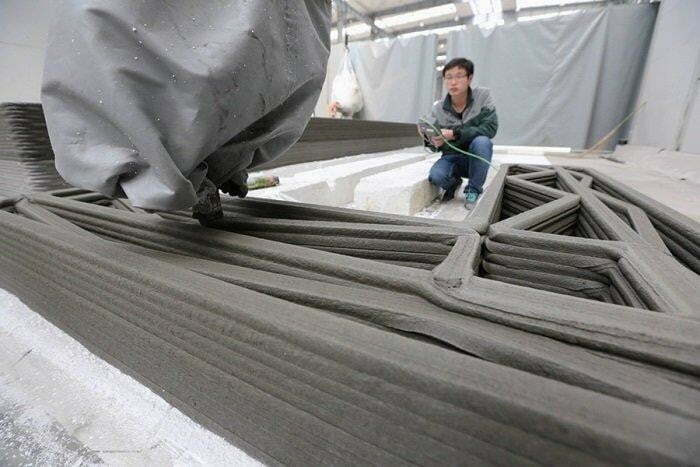 One of the most noticeable is the construction of the world’s first 3D-printed office building in Dubai. The office was built layer by layer using a special cement mixture and only took a total of 17 days to complete. It’s fast-moving and innovative projects like this that are continually changing the shape of the construction industry. As newer and more advanced machinery and applications are being created, we will likely see more advancements in the world of 3D printing. These advancements in the construction industry show a trend towards more machinery and computerised projects. This may result in construction workers and home builders needing to adapt and retrain to operate new innovative technology, many moving away from a solely labour-intensive role. It’s hard to predict what’s next to come but one thing is for sure, there’s a lot changing in the building and construction industry. If you’re only just building your first home or have been building investment properties for years, it’s always a good idea to keep an eye on the latest emerging construction technology and trends.